Full System - Front Mounts on 1998-2001 Mercruiser, GM 7.4L (L29) & 454 MPI Multi Port Fuel Injected engines w/ center discharge exhaust. The L29 engine can be identified by the two separate engine covers along with the air inlet throttle body that sits off to the STBD side of the enigne. This kit works on Bravo and straight inboard applications, WILL NOT work on V-Drive applications. Works on engines with Serpentine Belt. 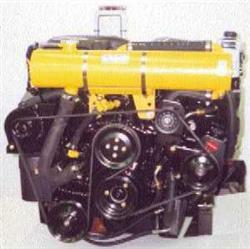 Magnum engines require additonal MC330MAGKIT to be ordered. Cools and protects both the engine block and exhaust manifolds. If engine is equipped with 3" or 6" spacer blocks between exhaust manifolds and riser, the appropriate ADDITIONAL Mercruiser Riser Extension Kit must be ordered. Kit comes complete with detailed installation instructions.